It's something we'll tell ourselves or others whenever it's necessary to take a pause, step back, and calm down. Breathing is an involuntary reflex that we do a million times a day without thinking. 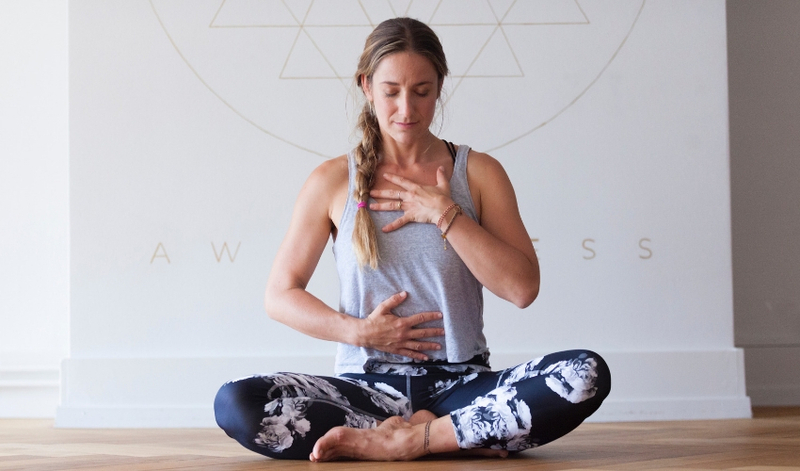 Mastering the art of yoga breathing with these exercises will allow you to regain focus, leaving you feeling cleansed and centred no matter how chaotic your life. The practice of yoga breathing is called pranayama, which combines two Sanskrit words, "Prana", which means life force, and "yama", meaning control. It is literally a way of controlling the life force. Methods of pranayama will increase your energy, reduce stress, slow biological systems, and provide a foundation for relaxation. Learning to control and extend your breathing during yoga practice or meditation accelerates the benefits of those practices. If you're performing yoga asanas for fitness, pranayama will allow you to see results faster. Using yoga breathing for energy will give you the boost you're looking for. When you need to wind down and relax your over-worked mind and body, proper pranayama will help. But, you don't have to use relaxation breathing with any formal practice. Whenever you have a moment to focus on your breathing, you will immediately feel more grounded and serene. There's a scientific basis to back up the effects of yoga breathing. Researchers believe energy production in the body is controlled by a substance called adenosine triphosphate (ATP). An imbalance of ATP leads to premature ageing, inefficient biological functioning, and increased stress oxidation, which is thought to contribute to disease and chronic conditions like asthma. One of the major components of ATP production is oxygen. Since breathing is a subconscious activity, we fail to realise how shallow our breathing is many times. This is especially true when we're stressed or under pressure, when it quickens. If you watch a baby sleep, you'll notice that they take deep, slow breaths that reach right down into their belly. It is the very definition of the phrase "sleeping like a baby". That kind of deep breathing exercises the lungs and improves their function, enhancing our well-being and allowing us to drink in an optimal amount of life-giving oxygen. Proper breathing doesn't just involve the lungs. Like a baby, we should draw each breath deep into the abdomen. Lungs are like balloons, relying in the abdominal and chest muscles to draw breath in and exhale. Contracting the diaphragm and expanding our rib cage allows more room in the chest cavity for the lungs to expand. Relaxing the diaphragm back to its normal, curved shape helps push the air back out. Properly coordinating all of these muscles helps you achieve balance through the core of the body and down the spine, radiating health and energy out through the extremities. It is similar to what flowers experiences in nature when they face the sun and draw its life-giving energy down through the stem and on to the roots and leaves. For these exercises, you'll need a yoga mat, if you have one, and comfortable, non-restrictive clothing. Don't worry about making mistakes. Just keep your spine long and enjoy. Pranayama will become second nature to your body with practice. This is a method of breath retention using 4-7-8 technique to control your inhalations and exhalations. If you ever have trouble sleeping, this will help. Exhale as fully as possible, making a whooshing sound as you breathe out. Breathe in slowly through the nose to the count of four. Hold your breath without straining to the count of seven. Breathe out again to a count of eight, again making a whooshing sound. By focusing on your breathing in this way, you'll clear your mind of clutter and distracting thoughts. This is a method of taking deep, controlled breaths in through the nose and out through the mouth for 30 seconds, drawing out each inhalation and exhalation. It's useful in the moment when you're facing a stressful situation, such as before delivering a speech or giving a performance. It will also help calm you down if you're angry or upset. A variation on this is Ujjayi Breath, which consists of doing the same type of breathing for 30 seconds, but taking the breaths in and out through the nose. There a few things that can release tension like laughter. This is a really good stress-reliever that adds an element of play. Try not to laugh at the end. Take a deep inhale through your nose while leaning your head back, raising your arms as you do. Leaving your mouth open and tongue out, exhale loudly as you lower your head forward; lower you arms halfway out to the sides as you do like you're making a muscle. Another counting exercise, this will also produce a deep calming effect. With practice, it should become smooth, slow, and natural. Place on hand on your upper chest and the other on the lower abdomen, similar to the placement when you;re doing the Goddess Pose in yoga. Inhale deep through the nose to the bottom of your lungs until the abdomen puffs out. Reverse the process slowly, forcing the air out through your mouth until your stomach is slightly pulled in, finishing by emptying your lungs of air as fully as possible. This is one of the most basic yoga breathing techniques. Often, when we're flustered or nervous, we lose focus and our sense of space Like several of these other pranayama exercises, alternate nostril breathing helps distract our mind and refocus our attention. Fold the middle and ring finger of your right hand in until they're touching your palm. The thumb, index finger,and pinkie should still be extended. Placing your thumb over you right nostril, breath in deeply through your left nostril. Now removing your thumb and placing your ring finger over your left nostril, breath out through your right. Leaving your ring finger over your left nostril breath in through your right. Replace the thumb over the right nostril, removing he ring finger from you left and breathe out. Repeat the rotation several times or until you feel centred. This may feel a little tricky at first, but practice will demonstrate the benefits in no time. If you're familiar with how a bellows can deliver energy and stoke a fire, you've got an idea of how bellows breath night help you. Rather than blowing breath out onto a fire, you're drawing it in and blowing out all of your stress. Just raise your hands over your head, fingers spread out as you draw in a deep breath. Exhale loudly with a "Ha" sound, forcefully lowering your arms all the way at your sides as you do. This is an ideal exercise for sudden tension release or if you're feeling drowsy. Breathing is life. Reading about yoga breathing will provide you with a foundation for the practice and theory. Learning how to do it properly requires the guidance of a qualified instructor and regular practice to experience the benefits first-hand. Join us for wellness seminars in Bangkok led by Leila El Krekshi, a certified yoga instructor who qualified at the world’s oldest organised yoga institution in India, and has practised meditation, yoga, dance and capoeira for most of her life. She also has extensive experience leading retreats around the world that integrate multiple therapies, including yoga, creative movement and mindfulness at akyra Thonglor Bangkok.